At a rally earlier this week, according to the USC student newspaper the Daily Trojan, Saphia Jackson, co-director of the USC Black Student Assembly, reminded students that “white supremacy hits close to home” and referenced the name of the Trojans' mascot. 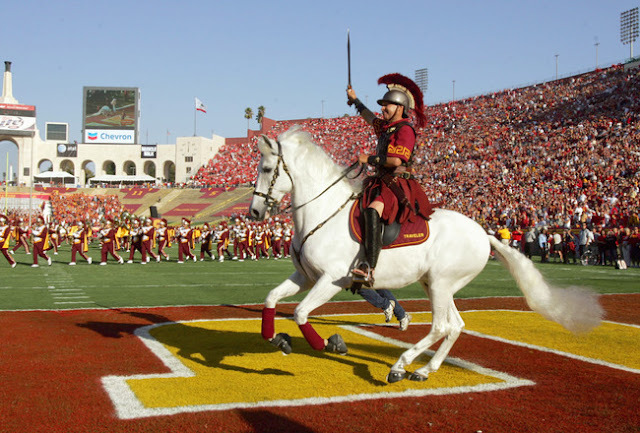 Gen. Robert E. Lee's favorite horse was Traveller, which is similar to the name of the USC horse mascot, Traveler. According to the Los Angeles Times, a USC spokesman pointed to a history of Traveler on USC’s website when asked about the name’s origin. Lee's horse was named Traveller with two Ls. Ms. Jackson did not discuss if she planned to change her last name because it is the same as the Confederate general, Stonewall Jackson. Jackson ... Jackson ... as in Stonewall Jackson? Shouldn't she be changing her name? When are they going to bring in the demolition crew for Mt. Rushmore? At what point will they change the name of my former high school Stonewall Jackson High School in Manassas,Virginia? The mascot of the school is the Raiders. What's even worse is that the horse is white. I mean, the Ancient Greeks were white supremacists and only enslaved blacks... (ignore all the other races they enslaved). So now we know the racist white supremacist student body names its university's horse for a known racist Confederate horse that is VERY WHITE, but did you know there's an employee at USC named "Nellie?" Google "USC Nellie" and see for yourself. And don't tell me the racist administration at USC was unaware that Robert E. Lee had a pet chicken named "Nellie." That's right, Google "Robert E. Lee Nellie" and discover the horrid and shocking truth. But it gets worse. His pet hen was BLACK and he made it lay eggs for him. When will this oppression of minorities end?